Bluetent Named to OUTSIDE’S Best Places to Work 2017 – 6 Years Running! Carbondale, CO (November 7, 2017) – Bluetent was named No. 18 on OUTSIDE’s Best Places to Work 2017, marking six consecutive years that Outside has selected Bluetent to their list. Not only are winning companies great workplaces for employees, but they respect the environment and encourage a balance between work and enjoying life in the great outdoors. 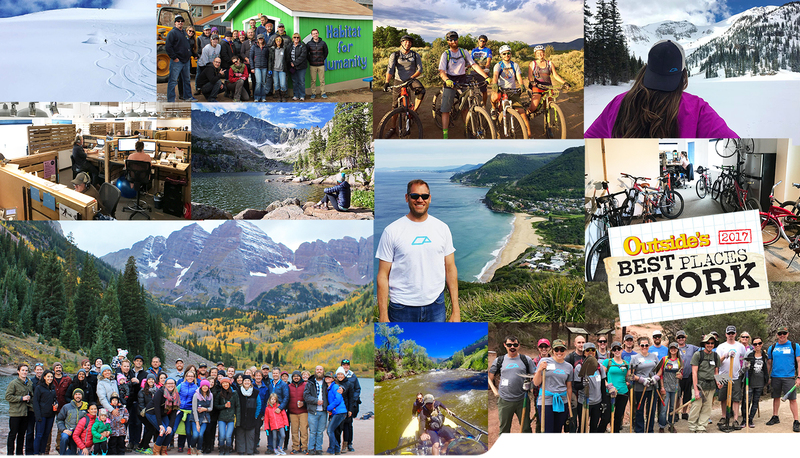 Bluetent’s company culture extends beyond the perks that accompany living in the heart of the Colorado Rocky Mountains. As a digital agency, Bluetent’s dynamic team shares core values including teamwork, passion, quality, courage, and work-life balance. Using these guiding principles, the team is committed to delivering innovative marketing strategies for their clients that inspire travelers and create long-term sustainable growth. Bluetent is a digital agency specializing in the holiday rental, resort, and travel industries. We provide eCommerce solutions, strategy, design, development, search, email, advertising, social, and content services. Bluetent ‘s holiday rental and hospitality eCommerce platform, Rezfusion, will process over $300 million in direct online reservations in 2017, and it currently supports 175+ hospitality businesses and holiday rental providers. The customizable platform fully integrates with leading property management software, is built on a leading content management platform, is PCI compliant, and delivers a cutting-edge user experience designed to motivate users to book. With a growing team of more than 67 individuals and a 5-time Outside Magazine Best Place to Work, Bluetent is driven to create comprehensive, successful, online marketing strategies and generate sustainable growth for our clients. Congratulations ,you deserve the best award.